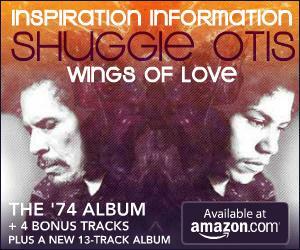 The world has Shuggie Otis back. And no one is happier about that than Otis himself. Shuggie Otis will be performing at MusicfestNW in Portland on September 7th. For this and other concert dates, please visit the Shuggie Otis Tour schedule. Q: Who are some of your favorite people to collaborate with these days? SO: I like to start my songs myself and then bring other musicians in. Right now, I like playing with my band, the Shuggie Otis Rite. We’ve got James Manning on bass, Michael Turre on saxophone, Larry Douglas on trumpet, my brother Jon Otis on percussion, Albert Wing on saxophone, my brother Nick Otis on drums and Swang Stewart on keyboards and guitars. Q: How did you like performing at the Music Hall of Williamsburg this past April? SO: That was one of the best concerts we had on the whole tour. I had a lot of fun, the crowd was very responsive and we were too. It was one of those nights where you can’t expect it to happen and you can’t buy it. We videotaped that show, I’m going to mix it down and it hopefully will come out by the end of the year on Cleopatra Records. Q: What’s it like being on the road these days? What do you love most about performing? SO: On tour feels like where I’m supposed to be. I’ve always wanted to tour, but many years I didn’t couldn’t get hired to work, let alone get a record deal. I had my own band here in the states, but I played with my father more often than I did with my own band. I had some non-musical jobs too. When I’m on tour, it makes me feel normal. When I’m at home, I’m in a neighborhood and in a cul-de-sac. My band is loud. The neighbors don’t complain, but I don’t feel comfortable. I like traveling a lot, I love playing for people and I love to see the crowds. Read the complete interview at The Brooklyn Paper. Shuggie Otis To Play Austin City Limits Music Fest! Shuggie Otis has confirmed two performances later this year at the Austin City Limits Music Festival! He will be playing at the Zilker Tent on October 6th and October 13th, with both shows at 7:30 to 8:30 p.m. local time. Tickets can be purchased at http://www.aclfestival.com/tickets/. More Shuggie Otis concert dates are listed in the Tour section.